Have you found an online vendor selling Vizcaya VXOP 21? 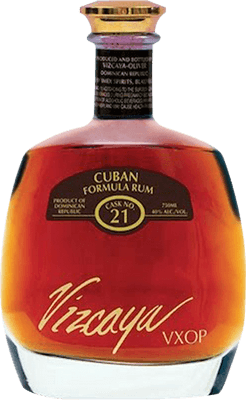 Vizcaya VXOP rum is produced from sugar cane that is distilled in small batches then aged for between 18 and 21 years in bourbon casks. The Oliver & Oliver distillery that produces Vizcaya VXOP rum was founded by Oliver Juanillo in the 1800s. It originally operated in Cuba, but in the 1959 revolution moved to the current Dominican Republic location. Many people make comments about this rum lacking complexity. I agree, but it tastes good. Real good. Smell is sweet but not sugary. Color and aroma are of apricot with hints of vanilla. Initial taste has alcohol on the front but quickly fades to a long lingering sweetness that is not overly sugary. I would compare this to Plantation XO minus the coconut and the.... uh.... complexity. Either way, I would drink this all day if you put it in front of me. Delicious. This is a must-try. Even a rum drinking novice can immediately tell the quality and smoothness. So smooth, you will question if it really is rum. Reccomended straight-up only. Distilled from pure sugar cane juice. Hints of vanilla, pineapple, and caramel. This rum delivers aromatics and flavors not dissimilar to the Trinidad rums I enjoy. But, somehow, I didn't get the complexities and richness I associate with rums in this price category. While it's beautifully presented, and will be enjoyed by those with a taste for the sweeter rums, it didn't quite live up to my expectations for an overall experience. Overall smooth, hints of vanilla on the nose, finishes with a touch of chocolate. Has potential to be even better if it wasn't so boring. I like the color and nose. The taste is nice but kind of "simple". by far the best sipping rum around. My personal favorite. Distilled from straight sugarcane and not molasses. Very sweet but goes down so damn smooth. It warms all the way down with no burn at all. You will not find a better rum in this price range hands down. More people need to try this immediately. This is a good rum, with a very nice sweetness to it. It has a unique scent/spice to it that kind of reminds me of a sweet men's cologne (I wish I knew the spice). Also a small hint of bourbon, which is somewhat subdued by the spice. All in all, a very good rum. Though produced in the Dominican republic, it still has the classic cuban character. The body is slightly thin but with nice caramel tones, fading into wodden spicy tingles. A no nonsens rum, sharing alot of qualities with the cubaney Exquisito 21 years. Shrnutí:	Ochutnáno na vydařené rumové degustaci u josého v Hořicích, což byla neformální akcička domluvená na Whiskyfestivalu. Toto byl třetí panák ochutnávky, hodně se mi líbil, stylově mi sedl, možná mít celou lahev, tak půjde postupně hodnocení ještě nahoru. Kombinace medu a Angosturovské propolisovosti u mě bodovala. Snad jen ta cena je jedinou vadou na kráse tohoto dominikánského klenotu. This has got to be one of the Dominican Republics finest representation of fine rums. 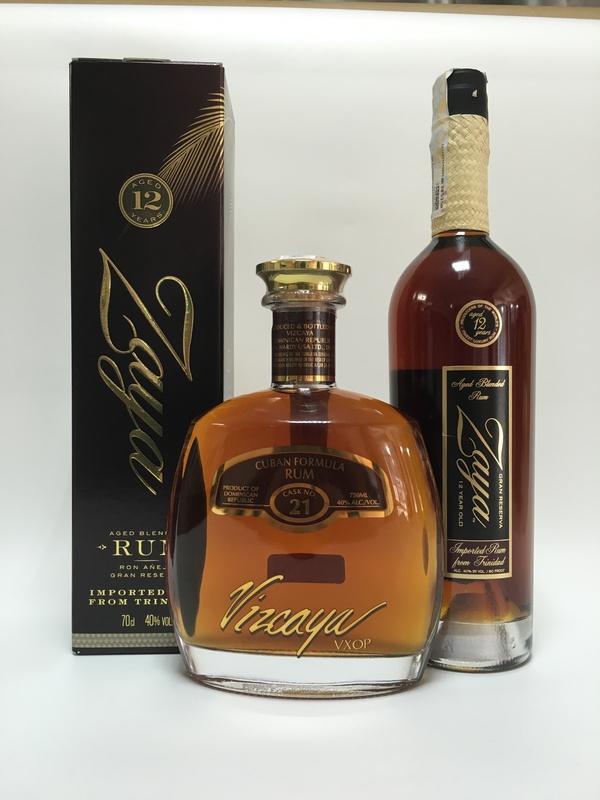 Distinctively aged using the popular solera method, Vizcaya VXOP 21 blends a nice array of various aged rums up to 21 years to provide a dynamic flavor combination for the palette with notes of caramel, vanilla, citrus and brown sugar. This is just another fine example of a fine sipping rum produced by Oliver and Oliver. This rum and Plantation 20th are my go to on the rocks $40 rums. Well worth the money. Next time I have a glass I will write thorough review. I cant help but be a bit annoyed by the marketing-scams, going on in the rum business. While this is a smooth, balanced, sweet, and in no way provoking rum, they just had to add 'Cask no. 21', which makes no sense other than being there to confuse newcomers to the rum-world. This rum is not 21 years old, as many newcomers might be thinking. It is not from 'cask 21' as there has simply been made way to many bottles of this, that they all could come from a single cask. This is a solera blend. Depending on the country, the number 21 means, that the blend simply has to have a small fraction of 21 year old rum in it. So what 'Cask 21' is, is simply dishonest marketing, ment to fool people. Sugar: 28 GPL. A sweet rum from the Dominican. The caramel and oak is up front in taste and aroma, but the underlying taste of cinnamon powers right through that. This is a fairly smooth rum without any complex taste factor, which I find is like a lot of other rums from the Dominican. It's a sipper if you want it to be, but I would classify this as a high end mixer. Well, this rum is diffrent, it's mature and alcoholic, woody aged flavor. Diffrent vision about aged rum. Vizcaya VXOP 21 er en let og lys rom med god duft og smag dog lige til den søde side. It's really not that good honestly. It's simple beyond words. Its 85% oaky 10% vanilla and some sugar and trace other things. The bottle is nice to have in the cabinet but really it's nothing special. Honestly buy 2 bottles of brugal anejo. They taste identical except brugal has a slight less oak flavour. Drinking this straight is alright. Slight burn but nothing bad. Honestly Brugal is made in Dominican Republic and so is this. It would be no surprise to me if this was made in the same place using the same formula as brugal just in a different cask. It might be slightly less smooth than brugal anejo. But for 20$ less I would take brugal. I also could just add sugar to my brugal and it would be this at a large cost savings. I give it 8/10 because it's drinkable straight and I like the oak flavor but it's still nothing flashy. It's just good, not great, not memorable. Just good. Much like that movie you saw a month ago that was "good" but not that memorable, what was it's name again? Good & Smooth. Vanilla, toffee, marshmallow and nuts. I had to travel to Quebec to get this one; Ontario's selection on premium rum is very limited. This rum is amazing; it is perfectly balanced on most levels. It smells of vanilla and butterscotch. It tastes like vanilla and banana. The entry is smooth and sweet and the finish seems almost dry and a tiny bit of spice hangs at the back of my tongue. Picked up a bottle in Maryland as the ratings were good. Thought it was an excellent supper, very smooth with harshness. I would buy another bottle. A balanced tasty contender that almost gets there, but the addition of sweeteners derails it. Not terribly expensive but so wonderfully sweet. This is my favorite sipping rum. I've found it in NJ and DE.